It was edited by Robert Scott, Henry Stuart Jones and Roderick McKenzie, and published by the Oxford University Press. It is now conventionally referred to as Liddell & Scott, Liddell–Scott–Jones, or LSJ, and its three sizes are sometimes referred to as "The Little Liddell", "The Middle Liddell" and "The Big Liddell" or "The Great Scott". According to Stuart Jones's preface to the ninth (1925) edition, the creation of the Lexicon was originally proposed by David Alphonso Talboys, an Oxford publisher. It was apparently published by the Clarendon Press at Oxford rather than by Talboys because he retired from the publishing business before the first edition (1843) was complete. The second through sixth editions appeared in 1845, 1849, 1855, 1861, and 1869. The LSJ is sometimes compared and contrasted with A Latin Dictionary by Lewis and Short, which was also published by Oxford University Press (OUP). 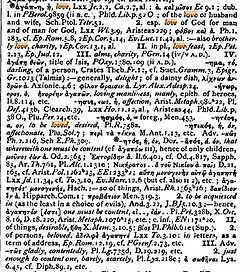 For comparisons between the two works, see the article on Lewis and Short's dictionary. It is also sometimes compared with the Bauer lexicon, which is a similar work focused on the Greek of the New Testament. Two condensed editions of LSJ were published by Oxford and remain in print. In 1983, the same year as the full lexicon's publication, A Lexicon: Abridged from Liddell and Scott's Greek–English Lexicon, sometimes called "the Little Liddell" was published. Several revised editions followed. For example, a reprint, re-typeset in 2007, of the 1909 edition is available from Simon Wallenberg Press. 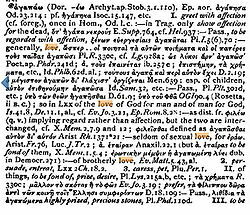 In 1889, an intermediate edition of the lexicon, An Intermediate Greek–English Lexicon, was prepared on the basis of the seventh edition (1882) of LSJ. In comparison to the smaller abridgment, this "Middle Liddell" contains more entries covering the essential vocabulary of most commonly read Ancient Greek literature, adds citations of the authors to illustrate the history of Greek usage, and provides more help with irregular forms. x ἐκβουτῠπόομαι to be changed into a Dairy cow, S.fr. 269a.37 R.
At the time of the publication of the first Supplement it was felt that the Ventris decipherment of the Linear B tablets was still too uncertain to warrant the inclusion of these texts in a standard dictionary. Ventris's interpretation is now generally accepted and the tablets can no longer be ignored in a comprehensive Greek dictionary. Liddell & Scott's Greek-English Lexicon (9/e 1940) is the most comprehensive and up-to-date ancient Greek dictionary in the world. It is used by every student of ancient Greek in the English-speaking world, and is an essential library and scholarly purchase there and in W. Europe and Japan. The main dictionary covers every surviving ancient Greek author and text discovered up to 1940, from the Pre-Classical Greek of the 11C - 8C BC (for example Homer and Hesiod), through Classical Greek (7C - 5C BC) to the Hellenistic Period, including the Greek Old and New Testaments. Entries list irregular inflections, and together with the definition, each sense includes citations from Greek authors illustrating usage. The Lexicon is Greek into English only, as are other ancient Greek dictionaries. This is the market expectation among both students and scholars. In 1968 the Lexicon was updated with a Supplement, which was available as a separate volume (until 1992) or bound together with the dictionary. Representing the culmination of 13 years' work, the new Revised Supplement is a complete replacement for the 1968 Supplement. Nearly twice the size of the 1968 edition, with over 20,000 entries, it adds to the dictionary words and forms from papyri and inscriptions discovered between 1940 and the 1990s as well as a host of other revisions, updatings, and corrections to the main dictionary. Linear B forms are shown within entries for the first time, and the Revised Supplement gives the dictionary a date-range from 1200 BC to 600 AD. It is fully cross-referenced to the main text but additions have been designed to be easily used without constant reference to the main text. The ninth edition of LSJ has been freely available in electronic form since 2007, having been released by the Perseus Project under the Creative Commons Attribution–Noncommercial–Share Alike 3.0 license. Diogenes, a free software package, incorporates the Perseus data and allows easy offline consultation of LSJ on Mac OS X, Windows, and Linux platforms. For mobile devices, both the Palm Handheld and the iPhone/iPod Touch feature data ported from Perseus. The Android Market also currently offers the intermediate LSJ as an offline downloadable app for a small price. A CD-ROM version published and sold by Logos Bible Software also incorporates the Supplement's additions to the ninth edition of LSJ. A new online version of LSJ was released in 2011 by the Thesaurus Linguae Graecae (TLG). The TLG version corrects "a large number of typographical errors" and includes links to the extensive TLG textual corpus. A Kindle version is also available allowing search from most Classical Greek word-forms and supporting a growing number of Ancient / Classical Greek texts for this device. "Complete Liddell & Scott's Lexicon with Inflections"
The Lexicon has been translated into Modern Greek by Anestis Konstantinidis (Greek: Ανέστης Κωνσταντινίδης) and was published on 1904 with the title H.Liddell – R.Scott – Α. Κωνσταντινίδου, Μέγα Λεξικόν τῆς Ἑλληνικῆς Γλώσσης. Read more at the wikipedia article. Diccionario Griego–Español (DGE). Contains the entries α - ἔξαυος. Intermediate Liddell-Scott Jones Greek Lexicon for Android (€.74 euro). Liddell-Scott Jones for Kindle ($8.55). This page was last edited on 5 January 2019, at 12:01.